Who says you have to be an adult to make a difference and get things done? After learning that the not-for-profit Ridgefield Playhouse was struggling, three Ridgefield boys wanted to do something to help. 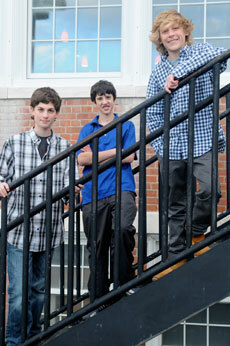 (Photo L-R) Cole Butchen, Michael Rosamilia and Tucker Hearon created a benefit event called "Ridgefield BandJam," which was born in 2010. This talent competition was created not just for Ridgefield students but to any area high school and middle school bands who believe they can rock. Under Playhouse leadership, the boys continued to spread awareness of BandJam, seeing it grow year to year since its inception. Passionate about supporting the Ridgefield Playhouse, they have raised over $100,000 through 2016. With all three boys off at college, the torch has been passed to a new group of amazing, community minded kids. (Photo R-L) Paige Hearon, Will Rosenthal and Austin Stietzel. The competition will continue in 2017 with local area bands submitting their original and/or cover tune recordings. Things heat up when 16 semi-finalist bands are selected during live tryouts at the Playhouse in March performing before a panel of judges. Eight finalist bands are then selected to compete in the finals in May. On behalf of the entire staff that makes BandJam possible, we thank you for your support. go directly to support the Playhouse.